Since Twitter added GeoTagging, the Popular Twitter App TweetDeck now can read them, this is a blog post about Geo-Tagging. Geo Tagging is a name for geographical data “hidden” in Meta Data of a Digital Photo, Video, or an electronic post of some sort. Let’s start with “Geographical Data”. It’s really where is a certain thing’s place is in the world. Every place in the world can be written down with a Latitude and a Longitude, both are Numbers, our Data, which our computers understand. In one method of noting this down, the more Numbers after the decimal point it is more accurate the area of the Location. For example, 51.507722 North, 0.127972 West, is Nelsons Column, in Trafalgar Square, London England. Check Google Earth if you don’t believe me, with 51.507722 – 0.127972 (Google Maps). Meta Data is actually funny name for Data that describes Data. Most often seen of this type of data is the date of creation or last modification. So in plain English, Geo Tagging is adding a data to a file of some sort that describes its location. There are several methods; Most of them involve the Global Positioning System. This produces two numbers which is Latitude and Longitude. It then places the data in file before it saves or transmits it. If you happen to upload it and stick the file’s location data in Google Earth, you get to see a pointer where you did stuff. 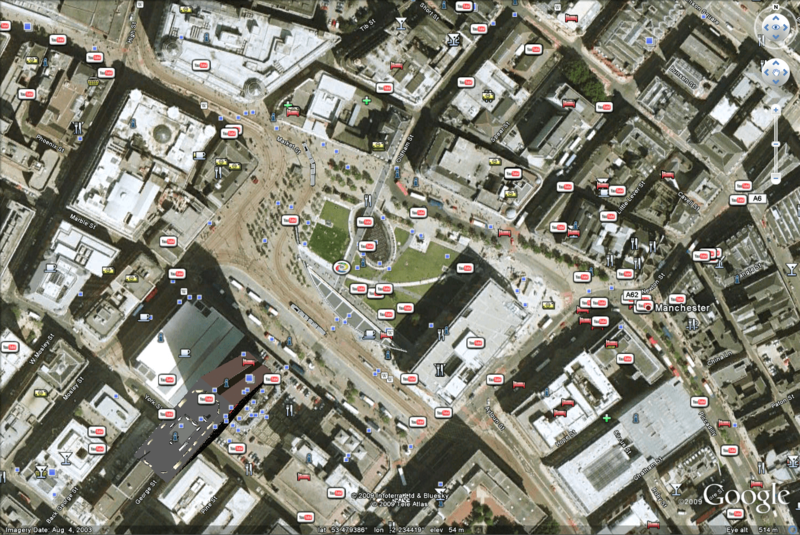 Try this shot screen shot of Google Earth on Piccadilly Gardens in Manchester. Most of those YouTube Videos where shot in that location. You can also add Location after the fact, as seen in YouTube, and Flickr. For Photo’s you need to have an ability to edit Exif tags inside Jpeg photos. One reason that the Accuracy Problem appears since GPS can’t get a fix, since the signal doesn’t travel well indoors, for example. The GPS system may give the wrong location instead. Several alternatives, which are mainly used in cell phones, uses Cell phone towers to get a location. Using Cell Phone Towers, alone allows Cell phones, such as my Blackberry 8320, to find it’s location even when doesn’t even have GPS hardware. Using Cell phone towers can be more accurate than GPS alone, since it requires less GPS Satellites to get a fix, or a mile or two out without GPS. Geo Tagging is actually an opt-in system in all the systems I’ve come across so far. Even Google Latitude, asks you to opt-in, which uses the same hardware systems for a different idea about locations, and is not Geo Tagging software in the same sense as the other applications in this post. Opt in? It means that that a person chose the option to use it. Most of the Barriers of Entry is actually hardware. However the costs are going down so it’s not a major problem in the future. If you want to Geo tag a Photo or Video, you may have to buy an GPS attachment for your camera if it doesn’t have GPS, or add the location manually when you get to a PC. Smart Phones that have the GPS system, or can run a map program from a separate GPS device, has the GPS system is disabled by default. The Blackberry has option this hidden in one of the setting menus, which means not unless you know what you’re looking for it you won’t find it. Twitter geo tagging is opt in on the site, and need a 3rd party software to use and see it. Twitter.com does not show that you have posted a Geo tagged message, unless the App posts a link in your tweet. As I post this there is a new wave of Applications start showing you the Locations of Geo tagged tweets. Twitter Geo Tagging can be turned off, and Locations attached to message can even be deleted. Due to limited amount of apps now available and it appears that Apps must make it clear that they will be stating your location. This will be easy for the user to quickly stop posting his location. For example, ÜberTwitter for the Blackberry, is the one piece of software that has a check box on the Compose Tweet Screen. With today’s technology, you can tag and upload photos and videos almost instantly, as well as tweets, you will be posting your current location on the net. This means that people can follow you in real time, not just by what you’re saying also where you ARE. It means that your friends and also your enemies know where you are. If you don’t want everyone to know where you live or work, avoid using geo tagging in those locations. Geo tagging may be a problem if you say one thing and the Tweet location says a different City, or country miles away from your message. This is not going to sit well if it happens once, but many times, that person is likely to be labelled a fraud. I can even see a Marketing stinker, I can foresee along this line, especially if they’re constantly talking about events at home. If all the tags are set in the Central business district of a town or city, and several off them are praising a company where the Geo tags regularly are. I’d admit that would be one revealed quickly. But Wal-Mart, has done something like that already, but in Blogging world. So far there isn’t a Twitter Application that allows users to post Locations manually, so far you’ve got to near their to post where you are. It may be a Twitter Rule. The Most problematic is that if you tweet from home, some people will be able to work out your home Address. Those interested in privacy, may want to be wary when using it. I’m going to really make this clear. Using Geo Tagging will share your location with the world. The companies that enable you to use it mainly use opt in for your safety, and made opting out easier than opting in. Geo tagging is a tool like email, which can be abused by other people by your actions. But unlike spam, your actions by giving out your location may let to hurting family members or your work colleagues for what you said or did. I’ve been told that Facebook will strip this data from photos, for this reason. Using Geo tagging is really a personal decision. If you use it, you got to know that you’ll be revealing what some people consider private information, your location. I’ve chosen to use Geo tagging on Twitter when I’m outside my house, but then the location it thinks where I am is just over a Mile away from where I really am.